Miss Mayhem was still hilarious, but it wasn’t as impressive as Rebel Belle. No spoilers for this book, but some unavoidable ones for book one—sorry! Miss Mayhem was a lot of fun to read. I love Harper so much, even though she’s still somewhat of a control freak. We definitely get to see her develop in this book, and her relationship with the original characters changes. I loved seeing her priorities (slowly) shift as she started to become more self aware. She’s still frustrating, but she’s getting better, and I have high hopes for her in the next book. David’s character develops a lot, not always for the better, as the stress of being an Oracle gets to him. He’s still a lovable geek, but he’s also an incredibly powerful Oracle who just lost the only family he ever knew. Though I wanted to shake some sense into him, none of David’s reactions felt wrong—in fact, they were probably exactly what I’d do if anything like this happened to me. His flaws become more pronounced, but they are so understandable that I still loved him. I liked the way that Miss Mayhem brought more characters into the main conflict. Ryan, now a Mage, becomes a larger character, though I still never felt like he had a lot of personality, which was disappointing. Also, Bee returns in this book, still a Paladin, bringing with her a ton of new conflicts. She’s gone through basically the same thing as Harper, but their reactions are very different. I liked the strange juxtaposition of her old and new selves that Bee showcased, especially when she hung out with Harper. The plot, like in book one, was paced well. There is never a dull moment, never a scene without multiple conflicts being touched on. I read Miss Mayhem in one sitting; I couldn’t put it down. The new plot places a lot of stress of David, Harper, and Ryan’s dynamic. At the beginning of Miss Mayhem, the three of them had settled into a sort of holding pattern, working with their magic but never pushing it. But when the Ephors show up in their hometown and started meddling, things start to fall apart between the three of them. Especially when Bee comes back and adds even more tension. 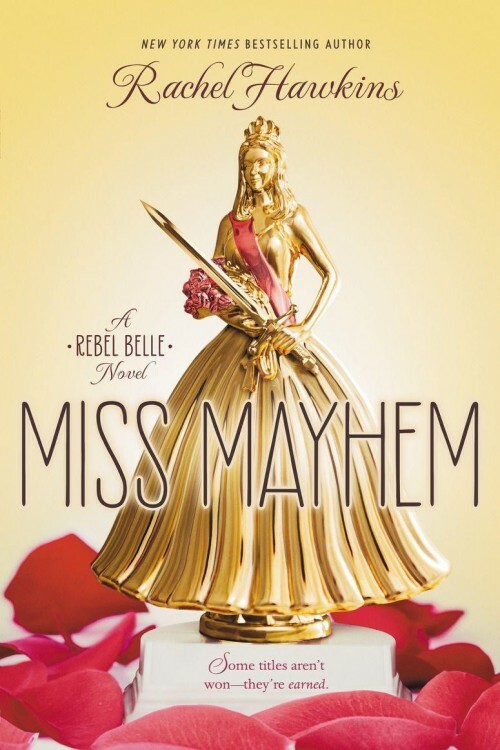 Though subplots grew out of this tension, I felt like Miss Mayhem lacked the powerful net of subplots that had made Rebel Belle so great. There were less contemporary moments, with more of the plot being directly connected to magic. I missed the deeper, emotional scenes that had made book one relatable and unique. The only subplot that really got me was the romantic tension between Harper and David. Though it killed me, it felt natural; it had to be a part of this book, and Rachel Hawkins made it play out perfectly. From this, book two’s overall plot is simpler than book one’s. It almost felt unfinished, like it needed a few more things to happen to make all of the plot lines gel together. For a plot based mostly on Harper having to complete a series of tests designed by the Ephors, the tests were underwhelming, and the Ephors were kind of lame, never complex enough for me. If you read Rebel Belle, you should definitely read Miss Mayhem. While I wanted more from it, this book is still fun to read, well paced, and hilarious. I’m sooooo excited for the third book, which comes out sometime in 2016!! !